Some more news on Larry’s book! UPDATE: Larry’s book has made the Amazon, Best Book of the Year List. This was an Amazon editor’s pick for one of the best-selling titles in the craft, hobbies and home books category for the year so far. Congratulations, Larry and Tom! 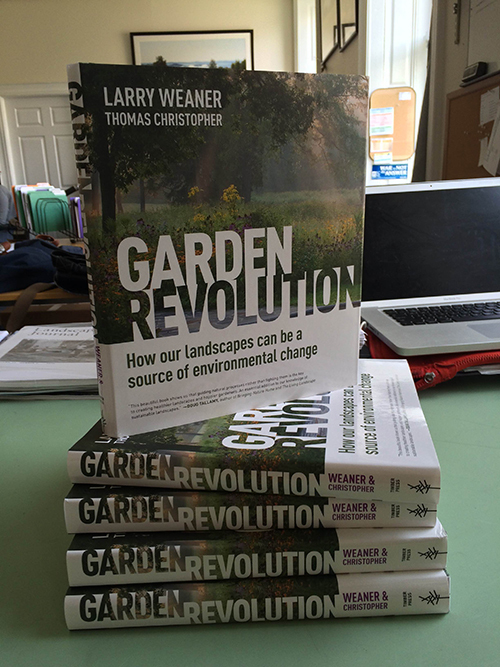 Larry’s book–Garden Revolution: How Our Landscapes Can Be a Source of Environmental Change–was released this May by Timber Press! Coauthored with noted horticulturist and author Tom Christopher, the book features Larry’s experiences creating native landscapes on projects large and small. Written in a personal, engaging style, the book explores how an understanding of ecological processes of change can be incorporated into gardens and landscape to create beautiful, dynamic places that require less labor and are more aesthetically rewarding and environmentally sound. The book abounds with practical advice, often counter to traditional horticulture, informed instead by techniques of ecological restoration and years spent observing plants in gardens and in nature. The book features beautiful photographs of meadow, shrubland, and woodland gardens and landscapes. Most images are by Larry himself and are joined by photographs by noted garden photographers Rob Cardillo and Karen Bussolini. We’re so proud of Larry and this beautiful book. To learn more about or to purchase Garden Revolution, visit Timber Press or Amazon. Cover photo by Rob Cardillo.